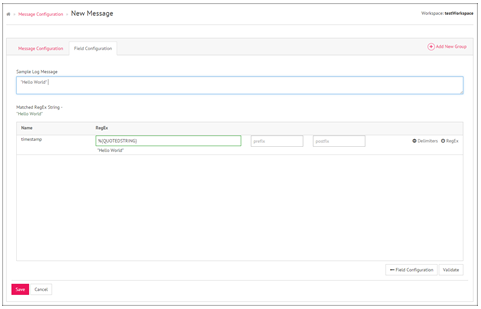 While configuring a new message, you need to define the Message Parser Type. Supported Parser Types are Delimited, JSON, Regular Expression, and Custom. Regular Expression parser type allows you to construct a regex pattern for the message. If the message contains multiple lines, select Multiline Required to define the message format. You can choose to either negate the line breaks or provide a regular expression to identify a complete message in the multiline message log. Next step is to validate the Regular Expression. 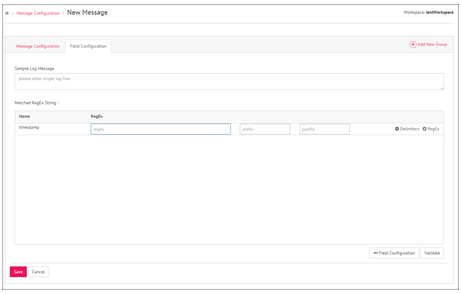 Configure a message field in the Field Configuration tab and click on the Validation button. To create a RegEx pattern for a field, click on the RegEx textbox. This will bring a new window of pre-defined patterns, and you can construct a new regular expression or select from the pre-defined patterns. While constructing the field, you can define a delimiter out of Prefix or Postfix. A matched RegEx string appears automatically on entering the values in the fields ‘Sample Log Message’, ‘Delimiters’ and ‘RegEx’. If correct, RegEx string turns Green in color. Click on the Validate button to verify the regex pattern. Custom Message Parser allows you to define a custom parser type, for example, you can write a method to parse data from XML to JSON. To create a custom parser type, define a class that implements the interface “com.streamanalytix.model.parser.ICustomParser” and you can write your custom code inside the methods declared in it. Provide the fully qualified name of the custom class in the configuration settings of the Custom Channel. 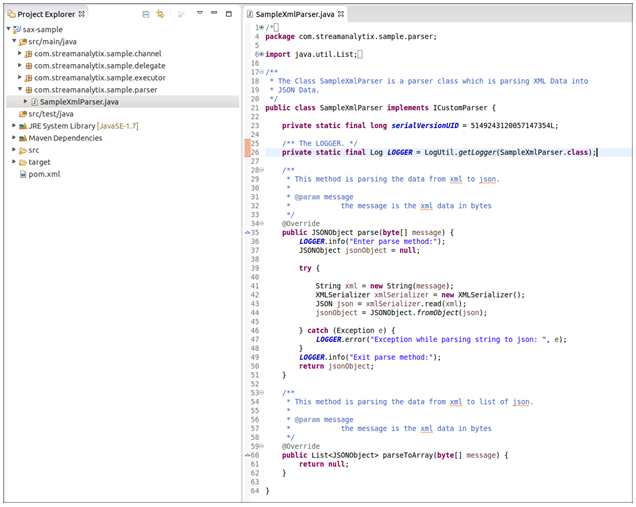 An example of a class name can be “com.streamanalytix.parser.TestParser”. 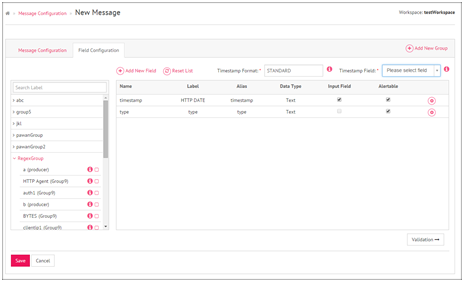 The Avro-Schema defines the message-fields configured on the Field Configuration screen.